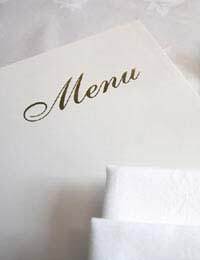 Set menus are a great way to keep costs low and offer your customers a good value meal. In the UK, set menus have something of a ‘low quality’ reputation, although the tasting menus of the Michelin starred restaurants are starting to change that. If you go to many European countries you will find that pretty much all restaurants – from the most simply, family run French bistro, to the most impressive, anniversary only type fancy places – offer a range of set menus. They will usually have a range of food ideas for each of the starters, mains and desserts, often with a few different set menu price options. For example, there may be a set menu at €15 for three courses, of which there is only two choices for each course and often only one choice. This is what helps to keep costs low – when you go to these places; most of the customers are having the lowest cost set menu. This makes it easy for the kitchen to operate and allows you to plan and order accordingly. Business lunches are a very popular way to get new customers into your restaurant. They have the added benefit of not going on too long either, as most people have to get back to work. This also means that people do not tend to order any alcohol, which is often profitable, but the fast turnaround and lack of choice more than makes up for that. If you are offering business lunches, you need to make it clear that your customers can eat a tasty lunch and be out the door within an hour – maybe even forty five minutes. Another popular lunch time choice is to offer a set menu of a main course and a glass of wine. Perhaps a bowl of pasta or a pizza, with a drink, for around £6 - £8. This is good for shoppers and business people. You can offer a couple of set menu options for the evening. Not every body wants to have a three course meal, so a good way to keep costs low is to offer a two course meal from the three course set menu – for example, starter and main or main and dessert. If the choices are from the same set menu, you will not be having to make anything different in the kitchen, whilst giving your customers plenty of choice. It is a good idea to offer a Sunday Lunch Set Menu as many families want to go out together on a Sunday and it helps them to budget accordingly. You do not need to offer your standard a la carte menu too on a Sunday, just a set menu. If it is appropriate for your restaurant, a selection of roast meats is always popular on a Sunday. As more and more families do not eat together during the busy working week, a shared Sunday lunch that is tasty and affordable is a welcome treat. It is worth offering half size portions for children and the elderly, too, so all the family can enjoy their Sunday lunch together.